In Baghdad at the end of last year, Waled Hamid brought a peculiar court case against a man who had sold him a house. Mr Hamid said the vendor failed to tell him that the house was haunted and was in an area notorious for ghosts that scream and hammer on the doors of houses at night. The reason for the presence of these ghosts is simple. Mr Hamid, previously unfamiliar with the area where his new home is located, had bought a house not far from Abu Ghraib prison. The place is regarded with horror by Iraqis because so many thousands were tortured and executed there under Saddam Hussein and, after his fall, other prisoners were mistreated and sexually abused by Americans in 2003-04. Mr Hamid says he did not realise that the area around Abu Ghraib was inhabited by the ghosts of murdered prisoners until after he had moved in. Now he says that he and his family are frightened, and even their dogs and cats are acting strangely. He wants his money back so he can live somewhere else in Baghdad. 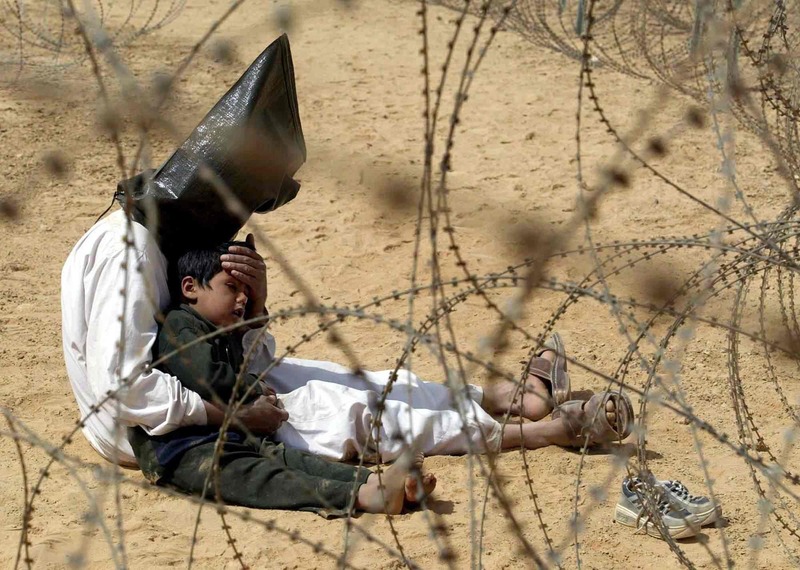 The publication of pictures showing Iraqi prisoners being abused by American soldiers was one of the epochal moments in the Iraq war. It showed that the US takeover of the country was as brutal and self-interested as most imperial occupations. For Iraqis and foreigners alike, the photographs discredited the idea that the US was interested in bringing freedom and democracy. It is worth looking at the grim aftermath of foreign intervention in Iraq as British, French and US involvement in Libya grows by the day. Both actions could be justified on humanitarian grounds (though Saddam committed far worse atrocities than Col Gaddafi). In Libya, foreign powers are at the start of a process aimed at overthrowing an indigenous government, while in Iraq the shattering consequences of foreign intervention on the lives of people such as Mr Hamid remain all too evident long after the foreign media have largely departed. This is the weakness of journalism. It reports, and its consumers expect it to report, what is new. The ill-treatment of Iraqi prisoners at Abu Ghraib, which once seemed so shocking, has become old news. But, for Iraqis, the ghosts of an atrocious past still walk and shape the fears and hopes of the living. A useful antidote to the preoccupations and narrow news agendas of the foreign media is the excellent Institute of War and Peace Reporting, which publishes stories from local journalists, and from which I learned the story of the ghosts of Abu Ghraib. Iraq slipped off the international media map in 2008, just as Afghanistan had done in 2002, in both cases on the mistaken premise that the enemy was defeated and the war was over. From about 2009, news editors began to notice that the Taliban were back in business and the Afghan war was on again. Now it is once again disappearing from the headlines as there is a surge of journalists into Libya to cover a new war. War has always been the meat and drink of international journalism. The same is true of home-grown violence. “If it bleeds it leads” is the well-tried nostrum of the US media. But how well is war reporting being done as the Arab world is convulsed by uprisings against the police states that have ruled it for so long? Will it do better than it did during the conflict in Iraq? A problem is that the causes, course, and consequence of wars are vastly complicated, but the reporting of them is crudely simple-minded. Saddam was once condemned as the source of all evil in Iraq, just as Gaddafi is today demonised as an unrelenting tyrant. This picture fosters the lethally misleading belief that once the satanic leader is removed everything will fall into place, and, whatever the failings of new leadership, it is bound to be better than what went before. The reasons why so much of the media have headed for Libya rather than covering Bahrain, Yemen or Syria are straightforward. There is a real war there, and the US, Britain and France are involved in it. It is also easy to get access to Libya without being stopped at the border when it is becoming impossible to get new visas to enter the other three Arab countries where there have been serious uprisings. The Mukhabarat across the region has decided that the presence of foreign journalists exacerbates unrest and the best policy is to keep them out. In Yemen, authorities have been refusing entry to the country’s few bona fide tourists on the suspicion that they might secretly be journalists. Crossing the Egyptian-Libyan border is, by way of contrast, not a problem, though the road journey from Cairo to Benghazi is a tedious 16- to 20-hour drive. Once in eastern Libya, dealing with the transitional council is easy since the council’s main, and possibly only skill, is dealing with the foreign media. Anti-Gaddafi demonstrators are much better organised than anti-Gaddafi militiamen. It would be difficult, in fact, to be worse organised than the rebel fighters who stream to and from from the front in their pick-ups. It is in taking too seriously these Gilbert-and-Sullivan advances and retreats that the media become badly misleading. The skirmishing in the small city of Ajdabiya, 90 minutes’ drive south of Benghazi, comes across as if it was akin to the battle of Stalingrad. Neither side has the numbers or experience to set up fortified posts in the city or make an effort to hold it. In Misrata, fighting is more intense but never as fierce as Beirut at the height of the civil war. All this matters because the exaggeration of the rebels’ military strength has led to a misunderstanding of Nato’s involvement. Barack Obama, David Cameron and Nicolas Sarkozy started by claiming they were launching air strikes to defend civilians. This has since escalated into saying that the aim of the war is to get rid of Gaddafi. The implications of these two aims, given the political and military balance of power in Libya, have never been made clear. Nato is not just aiding the rebels, but has already largely replaced them as Gaddafi’s main military opponent. If he goes down, it will be because of massive foreign intervention. Second, it is absurd to demand as a precondition of a ceasefire that Gaddafi should go, because only he can deliver a ceasefire. His departure ought to be the objective of negotiations after a ceasefire, which, to have any credibility, would have to be policed by non-Nato troops. When all this is over what will Libya look like? The country is gripped by civil war, whatever the rebels may say, and its legacy of hatred, like the troubled ghosts of Abu Ghraib, will take decades to disappear.